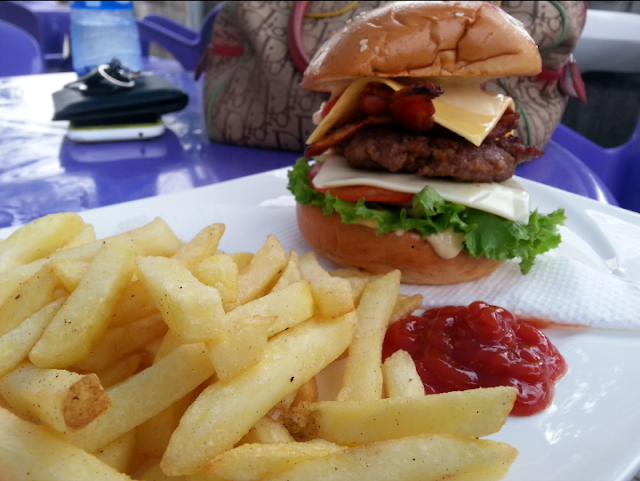 One ravenous afternoon last year I had lunch at Roadster Burgers n Grills in Lekki phase 1. My friend Ojay had their Insanity burger few weeks before and being a faithful foodie friend, avowed to have me try their stuff. If like me you're not the hugest burger fan, pictures of Roadster burgers might make you forget that. It was a Saturday afternoon, we were nearly blind from hunger so it was the best time to have a monster plate. 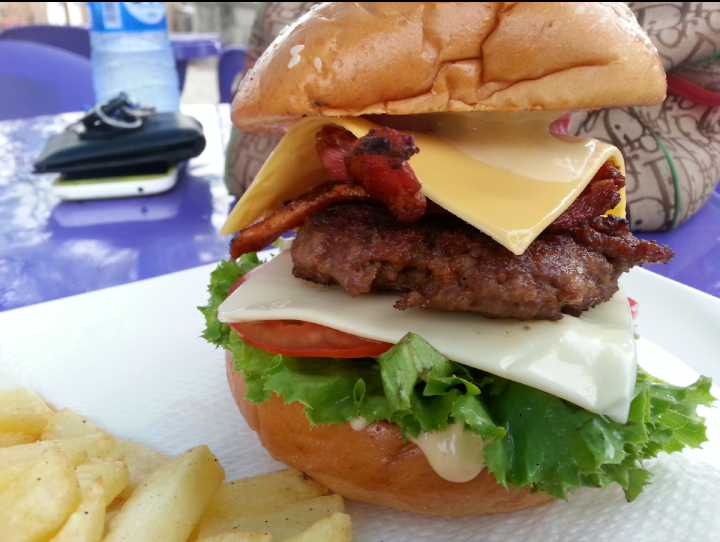 Roadster Burgers n Grills is at Plot 4, Block A2 Wole Olateju Crescent; coming from Lekki-Ikoyi Link Bridge it's the right turn after my favourite spot, Ice Cream Factory. The place has a minimalist look- outdoor order station where the food is put together, few colourful plastic chairs and tables, and a bamboo and thatch structure to one side if you want to be indoors. 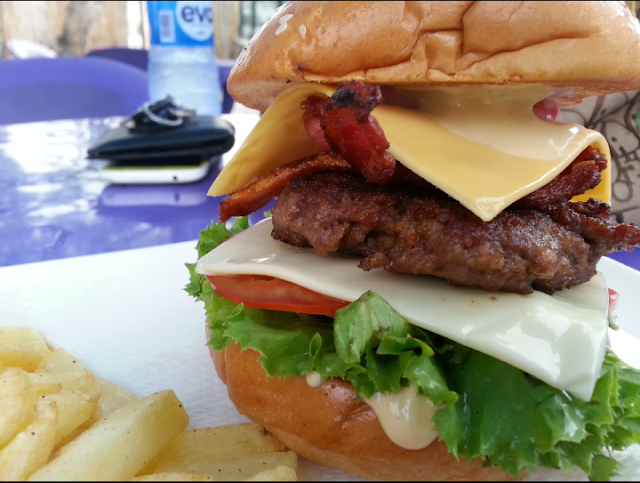 Ojay got the Classic burger. "Smoked beef patty in a freshly baked bun with fresh lettuce, tomatoes, onions and cheddar cheese"
I ordered the Bacon and Cheese burger. "A juicy smoked beef patty in a freshly baked bun with fresh lettuce grilled bacon, tomatoes, onions and cheddar cheese drizzled with French sauce"
Both came with a side of Fries and a canned drink. It was hands down the best burger I've ever had. 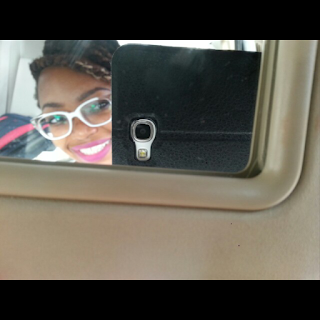 Far from basic, it's very in your face, bold and flavourful. And they did not skimp on meat. I hate when I'm eating a burger and halfway through the meat is gone. Who wants a half-soggy, half-dry bun and sad weepy tomatoes? This burger was 100 from start to finish. It can get messy to eat, but isn't that part of the fun? I mean look at it, you have to own a superhuman mouth to fit this burger in for a full bite. Just be prepared. This is not the time to launch your white silk shirt or your favourite white jeans. Same generic fries from the freezer bag. Not that you'll notice them while you stuff your face with the burger. I forgot to take a picture of Ojay's burger. Mine looked better. He confessed envy. The service was okay. They took the order and served it. Pretty basic, it came in good time, my stomach didn't implode first. No extra. Flip side, FLIES. We were outside, the thatch structure was in use. The flies came for us. I spent so much time swatting away flies I suspect I would have been transported to Nirvana if they weren't there, but they kept me firmly grounded. Just to get these pictures there was a fistfight so they won't get in the frame. Ojay and I agreed, "Definitely eat Roadster burgers, but not at Roadster Burgers". I was so full, I was on a stupid high. If I had the option of getting carried out of there best believe I would have taken it. 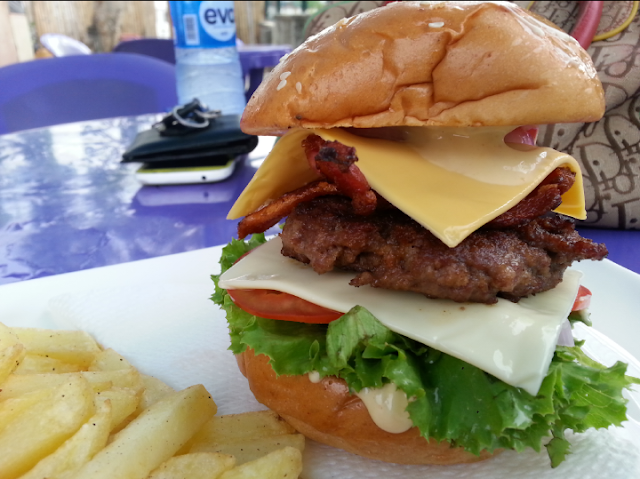 You can read livinginlekki's review of the insanity burger. She has more pictures of the place too. Roadster is on Hellofood so you can just order online, eat at home and skip the battle with the flies. Ever had Roadster's food? What was your experience? For some unknown reason, I always thought Roadster was the same as Roadchef. That burger looks goooood! Yeah, similar names can get confusing. More so as they both serve burgers. Aaaaah! It's never a good idea to read food reviews when one is hungry, I just got off Berry's page and was also tortured by photos of delicious looking food. The bacon burger that you had looked heavenly mouth-watering. @ "Definitely eat Roadster burgers, but not at Roadster Burgers". cracked me up. Lol. I cannot stand flies! Isn't Berry the torture Queen? Always tempting me with amazing-looking food. I love the burger, hope it is affordable? making me salivate. N2500 for the burger, fries and a drink. Not bad eh? Now I'm hungry. Burger looks yum.